If you were wondering what to make tonight, here’s a good idea! This recipe caught my attention instantly because I love Southwestern flavors + its quick to prepare + its pizza but more than that, there are so many undeniably good things coming together here! 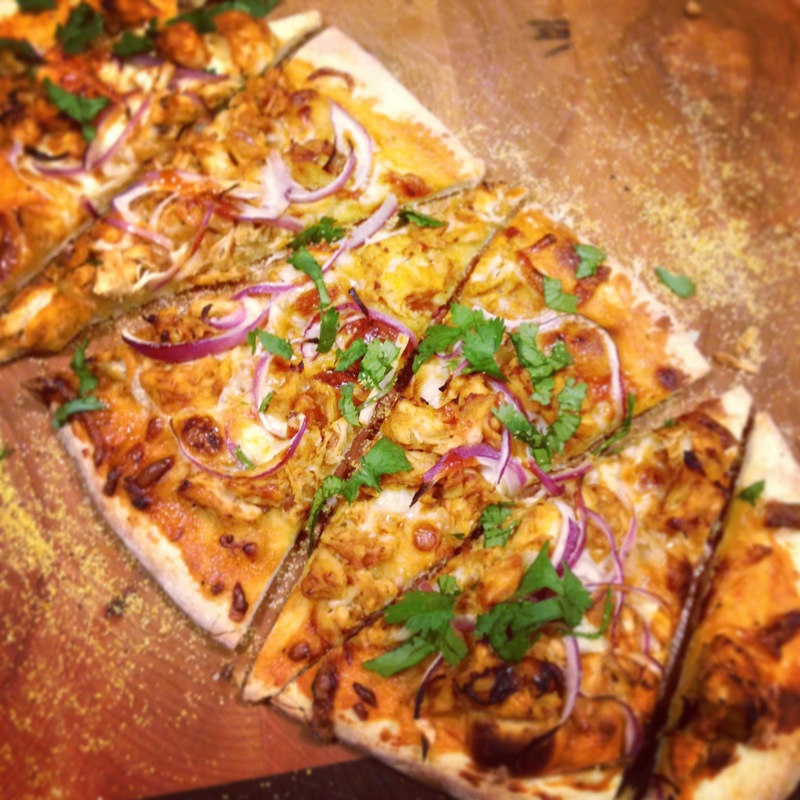 The tangy n’ sweet BBQ sauce, roasted chicken, the red onion and gooey-melted mozzarella cheese on a crunchy golden crust make this pizza hearty and satisfying. I listed the addition of fresh Cilantro as “optional” because I know some people don’t like it. Its really a love it or hate it kind a’ thing. 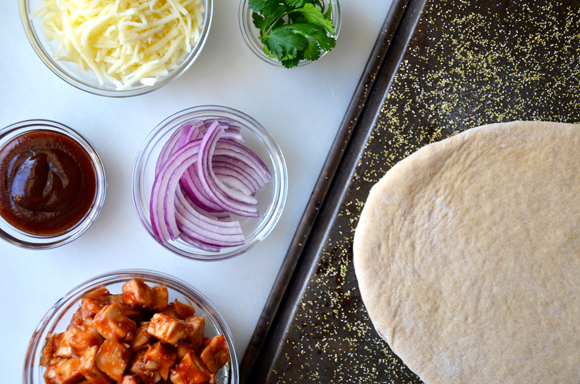 I personally can’t imagine making this pizza without it; I love it. In any case, the addition of a fresh herb to a dish right before serving just adds another dimension of flavor plus its refreshing and bright. If you didn’t make my “Best Pizza Dough Ever”, sigh, then you can use store-bought from a bakery, Pillsbury, Naan bread..you get the picture. This pizza will be great no matter what but when you make it with the “Best Pizza Dough Ever”, it gives it that desirable crunch-factor! Roll out the pizza dough on a lightly floured surface until it is roughly 12 inches wide and 1/4-inch thick. Invert a baking sheet and sprinkle it liberally with cornmeal. Transfer the dough to the baking sheet. 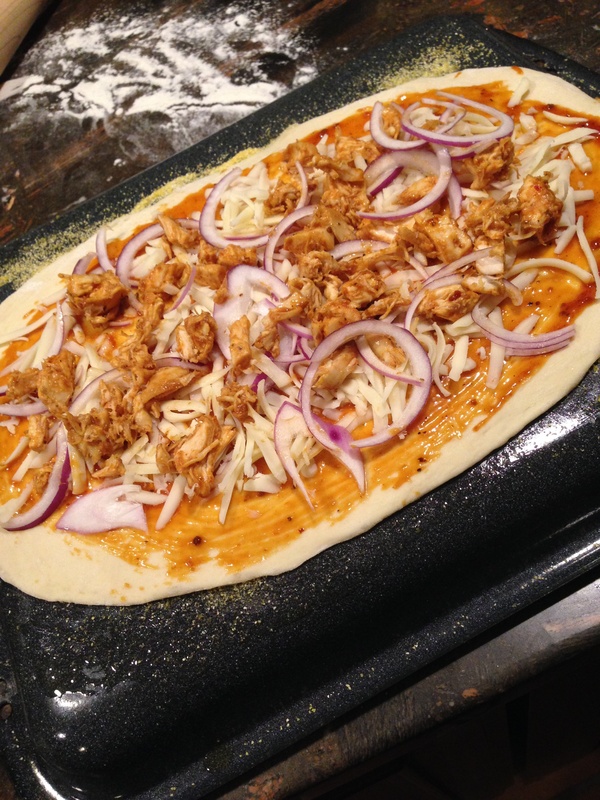 Sprinkle the mozzarella cheese atop the barbecue sauce, and then evenly distribute the coated chicken atop the cheese. Scatter the red onions atop the chicken. Bake the pizza for 10 to 12 minutes, rotating it half-way through, until the crust is fully baked and golden brown. Remove the pizza from the oven to a cutting board, sprinkle it with chopped cilantro, slice and serve. You can roll the dough into a 12-inch round pizza, or divide the dough into multiple pieces to form smaller pizzas, adjusting the baking time as needed. To leave a comment, just scroll down to the very bottom of this page!